A short account of the illegal nationwide postal strikes that spread across America in 1970. After two weeks, during which time the army was called out to break the strike, workers eventually won increases in pay and the right to negotiate on contracts with bosses. Beginning on the morning of March 18, the strike had been precipitated by months of stalling by union leaders and government officials. 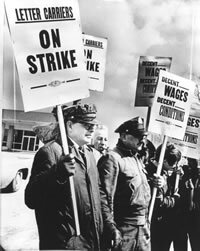 With no rights to collective bargaining, and having not seen wages increase between 1967 and 1969, anger amongst postal workers had been simmering for years. The Kappel Commission, a panel set up by congress to review the current state of the postal service, had recommended in 1968 that postal workers be given the same right as private sector workers to collective bargaining. The recommendation was rejected by Congress, and responded to largely with inaction by union leaders. Coupled with the subsistence level pay that most postal workers were surviving on, these factors made a strike seem inevitable by the end of 1969. Rank and file postal workers became increasingly vocal in early 1970, and the call for a strike was being taken up across the country. New York union leaders who were becoming fearful of what was unfolding travelled to Washington DC to impress upon Congress the gravity of the situation. Offered a promise to put forward a bill recommending a 5.4% wage increase (not to be enacted for several weeks), they returned to their members, who flatly rejected it. Union members began to call for a ballot on strike action. Declaring an immediate ballot unconstitutional, union officials managed to stall a vote until March 17. The majority of workers voted to strike, and the next day saw thousands of postal workers walk out across the city. Union locals who voted to strike often did so against the wishes of their union officials, many of whom tried, mostly in vain, to prevent a vote from taking place. Members of the Manhatten-Bronx Postal Union even chased their president off the platform when he refused to allow them an immediate vote. Nevertheless, thousands of postal workers were on picket lines by the end of the day. Citing the illegality of the strike, President Nixon quickly made an address on national television ordering the strikers to return to work, saying that the government would not negotiate under the pressure of a strike. Faced with the option of returning to work defeated or putting themselves into a position of direct confrontation with the government, the strikers of New York voted to stay out, and were joined by many others in the coming days. Postal workers across the country began to follow their lead and within days up to 200,000 were on strike in 30 major cities. Workers on strike in Los Angeles, Boston, Pittsburgh, Minneapolis and Chicago numbered into the thousands. Again coming up against stiff opposition from their leaders to even get a proposal for a strike ballot heard in many cities, it was reported in Chicago that 3,000 union members shouted down union officials who urged them to stay at work. With picket lines still growing a week after the initial walkout, the government began to consider legal action. With the entire postal system ground to a halt, a court order was taken out ordering the strikers back to work. The order was ignored, and despite the threat of jail for many workers, the walkouts continued. The injunction even threatened to extend the strikes outside the postal service, as many government employees vowed to walk out if legal action was continued against strikers. Nixon made another television appearance on March 25, confirming that he had ordered thousands of army and National Guard personnel into New York to begin distributing mail. New York was singled out as being the centre of the strike, but the possibility of troops being sent into other affected cities was left open. While claiming to recognise the underpaid state of many postal workers, Nixon's attempt to use troops as strikebreakers did nothing but stiffen the resolve of many strikers, who saw in the troops a force that had the potential to bring violence to the peaceful strike. The army soon proved itself incompetent at the task and failed to get the mail moving again. Becoming desperate and with few options left open, the government began to negotiate. Within a week after Nixon's last television address, the strike had been resolved, and the government agreed to most of the striker's demands. Postal workers won an 8% wage increase, and importantly, the right for postal unions to negotiate on wages and working conditions. Lasting just two weeks, the strike had been short, peaceful and successful. Often bypassing or completely ignoring a union apparatus that had actively tried to prevent a walkout, and that many knew was not acting in their best interests (even Nixon commented in his second address the extent to which the strike had gone against the "recommendation" of union leaders), the strikers had shown what mass action on the initiative of a militant rank-and-file can accomplish. Thank you for posting this, I'd never heard of this strike before now. Admittedly it was some years ago and in another country to me, but given that it got the President of the United States to address them directly and resulted in a mobilisation of the military during the Vietnam war (A period I do know a lot about both in Vietnam and America) this should give the event a bit more prominence. I doubt I'll shock anyone here but it is pretty clear that there's a culture of dismissal and/or suppression of positive examples of organisation and working class solidarity.